Ever watch a small child open a fabulous toy, only to play with the wrapping paper? Little Bird, a Caiques parrot behaves similarly, ignoring his toys beside him to play joyously with an abandoned paper towel. In addition to his own delight, "Little Bird" made a lot of others happy with more than 1.7 million YouTube views since the video was posted in October, 2015. Little Bird lives with a group of other birds, featured in their own videos on YouTube and Facebook. While some watching the video worried about Little Bird's freedom and ability to fly, his owners answered the question with a very convincing flight video by Little Bird on their Facebook page. 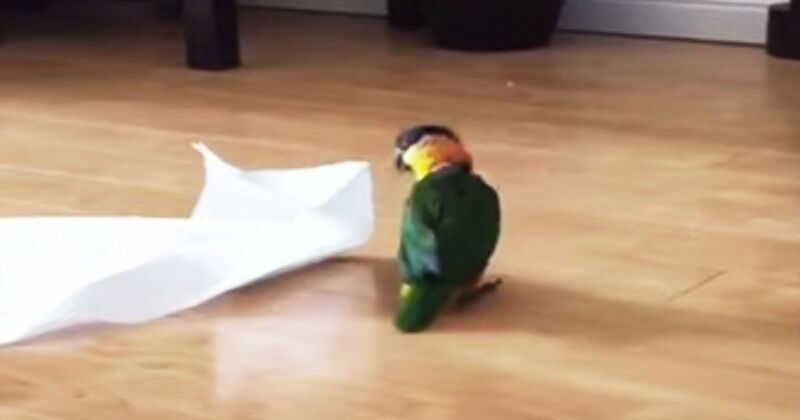 "His wings are not clipped and as you can see in this video from this morning, I practice recall flight training with him," his owner stated in Little Bird's flight video caption. "Caiques are generally not the strongest of flyers and often prefer to climb and walk." With that settled, enjoy Little Bird hopping in delight with his soft and absorbent plaything. Pass it along to give a smile to others.